We now offer our customers Custom Engraved Spirits, Engraved Alcohol and Engraved Liquor Bottles! One of our most requested items are our custom engraved spirits! Our customers love our personalized engraved Spirits. 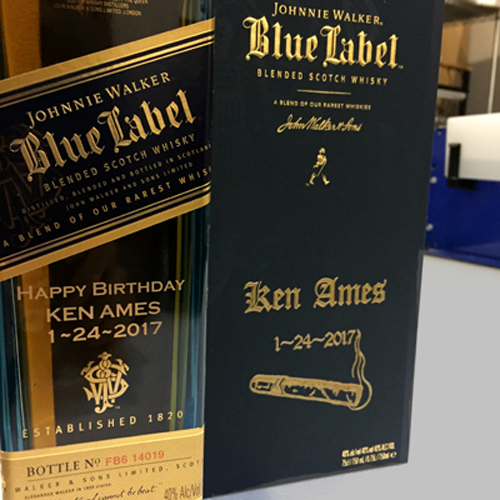 These engraved liquor bottles are the perfect gift to give someone for a special occasion, or to gift as a party favor for any event! We can personalize any engraved alcohol from Johnnie Walker Blue Label to Patron Tequila to Macallan 12 Year Scotch. Whether you want a name on the front of your bottle, or a festive design, maybe your logo, we can do it all. Custom engraved spirits are great gifts for that special event or recognition! 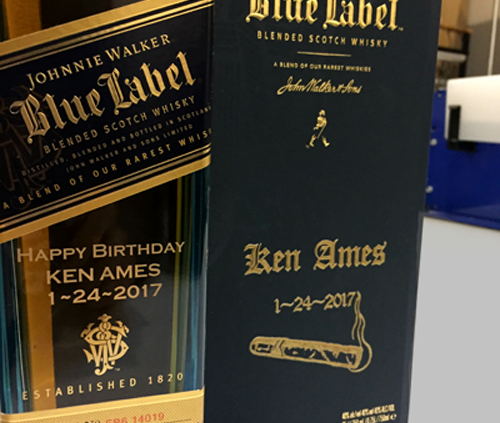 A Unique gift of Engraved Alcohol and Engraved Liquor Bottles is always a hit! A gift of a custom engraved spirit bottle to your friends or colleagues shows you have taken that extra effort to make it unique and special. An engraved liquor bottle makes a perfect gift for just about any occasion! Engraved Alcohol is also great for holiday gifts and college graduates. We can Personalize any great bottle of Engraved Spirits! Any Engraved Liquor Bottle, Any Engraved Alcohol!